I was once again inspired by a fellow bloggers mani and had to recreate it. This time the mani inspiration came from Jule from lackfein. The only nailpolish I own from the ones she used is Good as Gold but I thought: well, why not put the colours together a bit differently while still gaining a similar look. 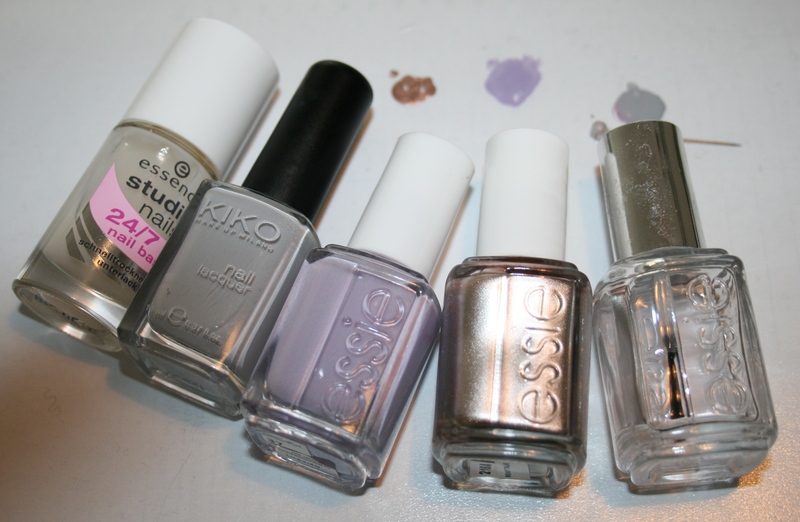 I used the Pale Grey Kiko polish and Lilacism and Penny Talk by essie. To make sure my currently rather bad looking nails don’t shine through I used Pale Grey as a base and then did a quick layer before I started dottting the nails with the same colour. 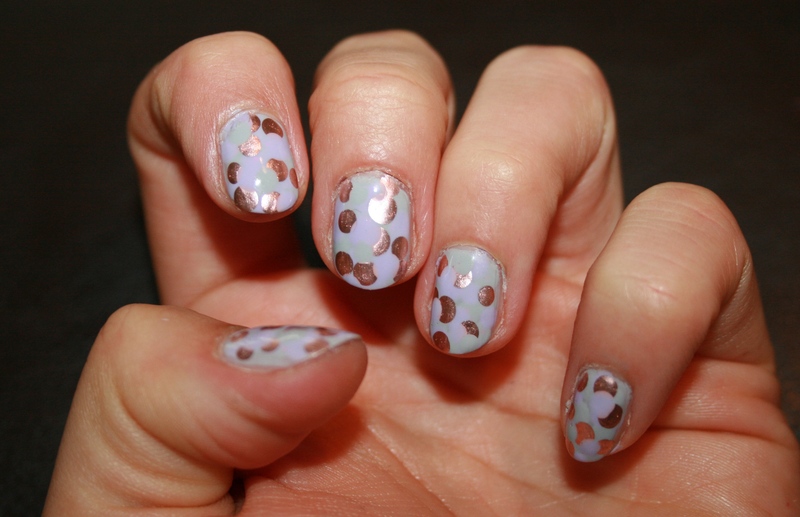 Next I did the lilac dots and then the metallic dots. To give it smoother transitions I put a few grey and lilac dots over the metallic ones. And as I read that some people asked Jule how long it took her to dot her nails I checked the clock, when I did it. It took me 30 minutes: 6 minutes for grey and 6 for lilac, 4 minutes in between to let it dry a bit and another 10 minutes for the metallic and the few grey and lilac dots. Add drying time for the base coat, the base colour and the top coat and it took about an hour to complete. By the way, there is another nail design from Jule that I absolute fell in love with which is “Fine Fine Neon Line” but it requires a neon nailpolish, even more so, probably for the best result a neon yellow one. But what should I do with it otherwise? So, you probably won’t get to see this here any time soon. I might rather go for some autumny look once I’m back to cold and wet Germany. This entry was posted in Nail Art and tagged 329, Dotted Mani, Inspired by a Blog Nails, lilacism, Nailpolish, penny talk by kathatravelling. Bookmark the permalink.